***TIP: Make it your own but don’t forget to try new meats! 1. Fresh Fruit and Veggies: grapes, strawberries, pears, apples, honeydew, blackberries, olives (all varieties), pickled okra, and caviar. 1. When it is just you and maybe your spouse or best friend for the night just make a small board/plate. It doesn’t have to be over the top fancy, just look at what you might have in your cabinets and go from there. 3. 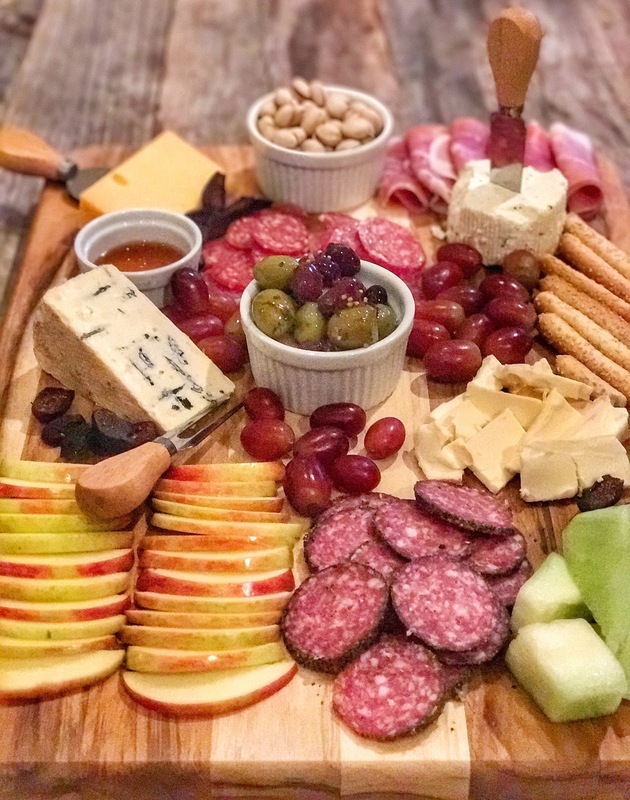 To fancy it up a bit, just roll you prosciutto up like cigars, cut you pear into wedges, and take a small chunk off of your blue cheese wedge to place in the middle of your fruit and meat. I also drizzled honey over my blue cheese because it don’t just look good but brings the flavor profile up 100%. 4. That’s all it took to make a small board for just you or for you and a guest. 1. Making a medium to large board is my absolute favorite. It takes no time at all, but your guests are always WOWED by the presentation and flavors on the board. 2. My FIRST of two board I’m going over is very affordable and I use it for everyday gatherings…football games, friends over for dinner, movie night, etc. 3. So….lets get started. Start with you cheese. For this board I’m using a Boursin garlic and herb cheese, brie, aged gouda, and blue cheese. 5. Finally my fillers help pull this board together. I used a honeycrisp apple, grapes, honeydew (it’s great when you wrap prosciutto around it), dried figs, mixed olives (placed in a small ramekin to add height on the board), pistachios (placed in a ramekin so I don’t spill them everywhere), honey (placed in an extra small ramekin), and sesame sticks. 6. The fun part is placing them on your board and making a small masterpiece. Also don’t forget your cheese knifes, they make all the difference when serving a cheese board. 7. My SECOND board is a little bit more pricey. This one is only used for special occasions or holiday events. 8. Again lets knock out our cheese and meat selection. For this one I chose sharp white cheddar and a brie wedge. My meats are salami and capocollo. 9. My fillers are the main show with this board. When you have something like caviar, you want to make it the star. I filled two small ramekins with ice to keep the caviar jars cold, and placed the caviar jars in them to serve. Again, STAR of the board so place it in the middle of your board and build around it. ***TIP: When eating caviar it normally is served with creme fraiche, red onions, chopped egg whites, chopped egg yolks, chives, and white toast triangles. I chose to just put red onions, creme fraiche, and white toast on my board. 10. My other fillers consist of a granny smith apple (pairs great with sharp white cheddar), olives, dried figs, pickled okra, and sesame sticks. 11. Again….this board is for celebrations and holidays only, due to the cost of caviar. The only people who could afford to do this board all the time would be Oprah or Bill Gates. 12. I hope you enjoyed my small tutorial on cheese and meat boards. I hope you try it for you next event! « A Healthy No Brainer Breakfast…Overnight Oatmeal!! !